Over the years a lot of people have asked me "how do I start freelancing?" and honestly it's been a struggle for me to answer that. When I started freelancing in 2015 it was by chance. I created a blog about Harlem and I would constantly create cool graphics for it as well as promote it via social media and a monthly newsletter. Naturally, I added it to my LinkedIn profile and was then contacted by a recruiter who was looking for a few freelancers to do entry-level marketing/research work for a small marketing firm. I ended up landing the gig and before I knew it I was a freelancer! I soon started taking on more responsibilities within the marketing firm and started leveraging the work I did there to gain additional clients. While it was a bit of "luck" involved in landing my first freelance gig, putting my work out there was really the first step to me gaining a client. So for everybody wondering "How do I start freelancing? ", here are son helpful tips on how to land your first freelance client! No one will know what you’re capable of unless you show them. If you don’t want to create a public online portfolio (though I highly suggest it) at minimum create a PDF or some type of presentation/package you can send to prospective clients. Side Bar: When I started freelancing I didn't have a portfolio but I did have an informational blog where I included info about myself along with articles which served as an example of what my interests were as well as what I could do. If you're feeling overwhelmed by creating a portfolio or you feel you don't have enough work to put into a portfolio, starting with a blog may be a great option for you. As I said, LinkedIn was where I got my first freelance opportunity. While having an online portfolio is a great way to direct potential clients to see your previous work, LinkedIn search options allow clients to come to you based on your profile and skill sets. It's like job searching while you sleep! Nothing beats good ol’ fashion face to face networking. You never know what opportunities are in the room. Approach it as looking to learn and build relationships rather than looking at it as a surefire way to get clients. Networking is a process that should be implemented throughout your long term freelancing strategy. I recommend attending at least 2 networking events a month (even more if you can swing it ). Also, it's great to go to events targeting professionals in the field you will be freelancing in but also attend events that target your clients as well. For example, my freelance work is within marketing and content development so I often attend events geared towards entrepreneurs/small businesses looking for more marketing skills. Remember: You just need one! Don’t think that you need 5 or more clients out the gate because you probably don't have the systems in place to properly meet that volume of work. Take it slow. Slow and steady wins the race! If you have any questions or suggestions on how to gain your first client feel free to hit me on social media or comment below! So you want to be a freelancer? You’ve come to the right place. I started considering myself a freelancer about a year ago but realistically I’ve been freelancing for about 3-4 years now. Freelancing is defined as working for different companies at different times rather than being permanently employed by one company but at it's core, freelancing is using your skill set(s) to generate income. If you just internally said to yourself “hey I already do that” you my friend, are a freelancer! And it’s time to own it and promote yourself as one.This post will get you on your way. Now, if you just said to yourself “that seems like something I can or want to do” then you're in the right place as well. So let’s skip all the small talk and dive right into how you can jumpstart your freelance career! Let’s start with the site that has changed it all for me, LinkedIn! In 2015 I was a trainee in StreetWise Partners career development program. If you’re not familiar with StreetWise Partners, it’s a non-profit with a 3-month career mentoring program that delivers high-impact professional development services with 2:1 career mentoring in corporate settings. One of the first requirements of this program was for the trainees to create a LinkedIn. Now at this time, I’ve had LinkedIn for about a year but my profile…Oh boy! It’s was so neglected. Like, seriously neglected. No profile picture, no updated information, no endorsements… Nothing! One of my mentors encouraged me to use LinkedIn as a tool to connect with the companies I wanted to work for. So I went to work. I added a profile picture, updated my work experience, added skills and connected with people I knew as well as people I wanted to know. I started following companies I had interest in and sharing content that was relevant to me and my following. Now I’m not here to say it was an overnight success. It took me about 3 months to get over 500 connections and almost a year to get my first client from LinkedIn. But I must add that despite what my mentor proposed, I never actually used LinkedIn to find work or really connect with people from certain companies. I’m simply used it to share content, industry and self created, and just by doing that I was able to score 2 major clients as well as work with creatives on projects that I wouldn’t had the opportunity to be apart of if it wasn’t for LinkedIn. I say all this to say, don’t underestimate the power of LinkedIn. Sure it’s not as appealing to the eye as Instagram or as humorous as Twitter, but it’s instrumental in taking your freelance career to the next step. The name speaks for itself. Freelancer.com is one of the top sites to find freelance work. As the world’s largest crowdsourcing marketplace, the site has nearly 20 million users and have posted just under 10 million jobs to date. There’s an ambiance of opportunity on the site which in turn draws more talent and naturally, more competition. You may have to lower your rate for your first gig or two until you build your reputation for providing reliable and quality work. With that being said, I still would recommend using this site especially if you’re just starting out because it can be really hard (and time consuming) to create leads for your business in the beginning. With websites like Freelancer, Elance and even Thumbtack, it cuts the time you would’ve spend looking for clients because there already on the site looking for you!This allows you to focus on getting the job done and expanding your client base. ByRegina is my go to website for everything freelance and infoprenuer based. Regina Anaejiona is the creator of the site and she’s built hundreds of websites has extensive knowledge on building brands. If you’re a freelancer it’s safe to say that you have a skill or two. This site helps you tap into how to make money from that skill in more “non traditional ways”. Let’s say you’re a freelance writer who gets paid to write for websites and publications. You can grow your business by continuing to apply for writing jobs and pitch publications but you can also use your experience to create courses, workshops and possibly even a ebook to share your experience and help others. ByRegina.com teaches you how to do all of this. From finding your brand identity to creating full out courses, no subject is too big or small for ByRegina.com And she’s like the Queen of FREE info that’s actually helpful. Right now I’m enrolled in Free Blog School, a course she created that helps you build Wordpress and/or Squarespace blogs from scratch. It’s truly amazing! That quote has since stuck with me since. As entrepreneurs and freelancers, it’s important that we spend less time preparing for the fishing trip and more time actually trying to catch the fish. That’s why I love fiverr.com. Out of all the sites on this list, Fiverr has to be my favorite because it’s what I like to call “dual resourceful”. If you haven’t heard of Fiverr it’s an online market place where you can get almost anything done for the incredibly low rate of $5. You can get a blog post written, a logo created or even can find you a virtual assistant for the starting rate of $5. Now of course the more intricate the project, the more you may have to pay but it’s usually always a steal. Now not only can you purchase services to help further you entrepreneurial endeavors, you can also sign up to provide services. Fiverr is a great site to make some extra cash for your business and help you gain more clients. So are you ready to quit your day job and bet your life on succeeding as being a full time freelancer after reading this? Probably not but I hope this was helpful to you and your business and just know there's so much more to come! If you have any questions or topics you would like to see covered on the blog let me know in the comments section. Until next time! It's Time to Take It Up A Notch... You Ready? It seems like forever ago that I created this site (actually it was about 6 months ago) with the hopes of furthering my freelance business and helping others do the same. So, was it a success?? Well... Partially. My freelance business has definitely picked up. I've worked with brands from different states, acquired a restaurant in Manhattan as a client and even got a chance to work at a VC backed Tech company heading up their influencer marketing campaigns. So yes, business has certainly picked up but I'm greatly disappointed with myself because while one of the main reasons I created this site was to further my business, it was also to help others do the same and in that regard, I've failed. But I've never been the type to accept failure so June marks the month that I will revive RosiSellers.com. And man, it’s going to be better than ever! I have some new content that will help you take your brand to the next level! I’m also working with some cool entrepreneurs and creatives to bring you awesome content. Basically I’m writing this post to let you know that I’m back baby! And I want to thank everyone who continues to take this journey with in real life as well as virtually. I also recently started a Twitter chat “#CreativeTalk” with the mission to help creatives grow their businesses as well as their networks. 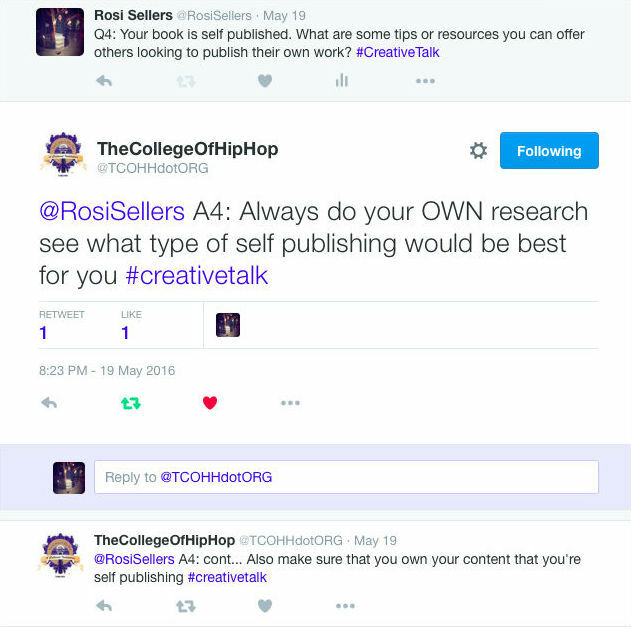 Here are a few highlights from my first chat with TheCollegeOfHipHop.Org, an online learning hub focused on educating aspiring artists, A&R’s and CEOs on the music business as well as entrepreneurship. If you're interested in being a guest on #CreativeTalk or have a topic you would liked to see covered contact me HERE. Be sure to keep and eye out for new content this week. See ya soon! 2015 has been the year of exploration for me. I’ve tiptoed a bit out of my introverted comfort zone quiet a few times and decided to explore because frankly, “if you want to inspire, you have to explore”. So when an old friend of mine invited me out to Brooklyn to partake in something called a blind contour session, I was immediately intrigued. Sure at this point I had no clue what blind contouring was but that didn’t really matter. My intrigued stemmed a bit from the name, I mean come on…“blind contour”… Who wouldn’t be intrigued? And the other half stemmed from knowing anyone my homeboy was working with was worth checking out. My homeboy’s name is Rej. He is an amazing creative that I’ve been able to see grow and harness his crafts over the last couple of years. He has a unique eye which I love! You can check out some his work HERE. So I made my way out to Brooklyn, Bushwick to be exact. A neighborhood that as a New Yorker I’m a bit ashamed to admit I have no idea how to navigate. But hey I’m from Harlem, so I’ll just use that as my excuse. My stints on the L train are typically shorter. I love Williamsburg and frequent Bedford Ave. A few times I got a little adventurous and traveled out to the Lormier stop for business but this particular quest left me at the Jefferson Ave stop. As soon as I walked out the station I felt the energy. It was calm, slightly griddy yet amazingly beautiful. The art immediately smacked me in the face once I had a chance to look up from my Google Maps on my Iphone which I was using to find further directions to the cafe. As I walked to AP Cafe, our location for this particular meet up, wall after wall caught my attention as they were covered in massive murals of creative artworks. This article was originally posted on The Cool.